Patricia Lee Smith's contribution to American rock culture is so much more than the chorus from 'Because the Night' that you're humming right now. She is one of the punk story's most careworn touchstones and her life has been something of a rock and roll fairy tale, with its fair share of drama and danger. Patti Smith's narrative on American protopunk culture is so clearly noted because she has always been so much more than a singer or songwriter, filling her work with poetry and the spoken word, and moving on to part-time careers as an artist, a photographer and as an award-winning author. Her biggest hit here and at home was 1978's 'Because the Night'. Co-written with Bruce Springsteen, it could easily have been a Laura Branigan or Pat Benatar song. Nonetheless, it gave Smith a platform that her influence merited. She's suffered emotionally and physically, losing a brother at a young age and also falling nearly five metres from a stage onto concrete and breaking her neck, among other highlights. She's recorded arguably American punk's most influential record, 1975's 'Horses', won a National Book Award for her memoir 'Just Kids' and is former White Stripe Meg White's mother-in-law (a fiver if you can name a cooler in-law). Following a recent exhibition of her photography with October's 'Camera Solo' in Hartford, Connecticut, and five years after her last album (2007's 'Twelve'), Smith is taking her stories back on the road. 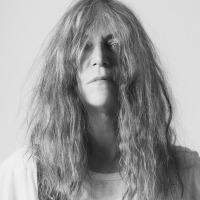 Patti Smith kicks off the tour in Wolverhampton on 25th June, followed by Cardiff, a new date in Laugharne (on sale last week) and then the Bath Forum on 28th June 2012. The five additional dates begin in Newcastle on 4th September, followed by Manchester, Leeds, Cambridge and, finally, London (Troxy) on 13th September 2012. We will have tickets available for the September dates when they go on sale at 9am on Friday 20th April. The earlier gigs are still available, with prices from £17.50.